"I bought this book two weeks before my private pilot checkride and read it in its entirety in just a few days. It ended up being an almost perfect refresher of all that I had learned in my private pilot training. It really helped me get my confidence up before going into the oral exam portion of the checkride." Captain Zulu's Quick Reference for Pilots briefly achieved a ranking of #28 on the Apple iBookstore list of the 50 best selling non-fiction digital books. "Captain Zulu's Quick Reference for Pilots is a great reference for the student pilot. Great illustrations and cartoon characters also." 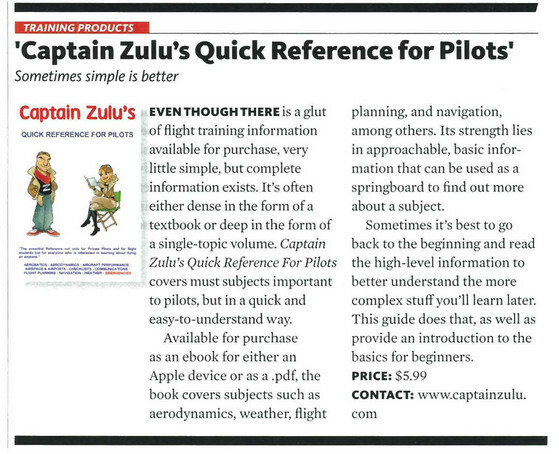 "Captain Zulu is a great source of reference information for private pilots and students alike." "Hello! I used the digital version as a student pilot, and review it as a private pilot, and was still waiting for the print version (which should be leather bound as is any classic treasured piece of work). Any word on when it will be in the printed version?" "Take Captain Zulu and a Sectional Chart with you on your next visit to a desert island. In a week or two, you will have mastered most of the book learning needed to become a Pilot."